DeSoto Chamber of Commerce recently issued the following announcement. The Third Annual DeSoto Living! Festival - Our Signature Event - Is Back! Food, Non-Food, Non-Profits, small or large businesses are welcome! EarlyBird Registration is only $75 and ends March 1st. 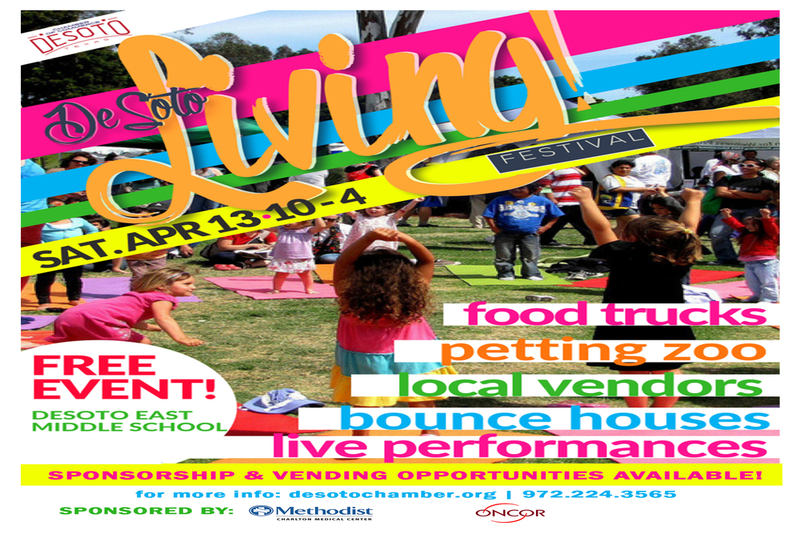 This festival will feature a variety of fun family activities for all ages, including a Petting Zoo and Rock Climbing Wall and more in the PetZone, along with the DeSoto LIVE Stage that will feature a variety of local artists in the Dallas Area. The KidZone will feature Knocker Ball! Kids of all ages can sign-up to play 5-minute games throughout the day. There will also be a 30 ft. King Kong Slide, with a giant Gorilla and T-Rex attached to 3 huge slides. The Wellness Zone will feature a variety of healthy businesses along with a 60 ft. obstacle course for kids, FREE Eye Screening done by the DeSoto Lions Club. The DeSoto Safe Zone and DeSoto Drives will include the Food Truck Lane with over 15 food trucks to choose from, a Car Show, Bumper Cars, DeSoto Fire Truck and the DeSoto Police MRAP will also be some fun vehicles to see including DeSoto BMX Display. The MarketPlace Zone & DeSoto Green Zone will feature an array of local & small business located throughout the Best Southwest Area, including the Oncor Cherry Picker and Republic Services Truck and other energy savings displays. Face Painting, Raffle Drawings are just a few other fun activities. THIS IS A FREE EVENT with activities for the ENTIRE FAMILY! Vendor Spaces are going fast, so reserve your space today! Please note: Product categories are limited to a specific number of vendors. ie., limited number of snocone vendors, bbq vendors, etc. Click the image below to view sponsorship opportunities. Want to get notified whenever we write about DeSoto Chamber of Commerce ? Sign-up Next time we write about DeSoto Chamber of Commerce, we'll email you a link to the story. You may edit your settings or unsubscribe at any time.